wrex, those pics are absolutely horrible. Garfinkle's Airpump Idler Pulley: Keep the stock contact patch on your water pump w/o running Airpump! Wow there are some pretty terrible FD`s out there. thanks for photoshopping that wing to make the point even clearer. That car was at the shop for tuning. Unfortunately you cant make everyone buy stuff that looks good and compliments a cars lines. worst stock FD I've ever seen. ^Damn, that is some good airbrush, but such a waste. Polluting the environment one revolution at a time. "Rotarys come with built-in traction control, its called no torque"
It really is top notch work. Just not on an FD, or any car for that matter. It's just cheesy. Any kit that makes ANY car's front end look like that must be destroyed by fire immediately. Those wings only look good on supras. Last edited by Phoenix7; 05-21-2008 at 12:14 AM.. I agre, that thing looks ugly poor FD it should be in better hands . 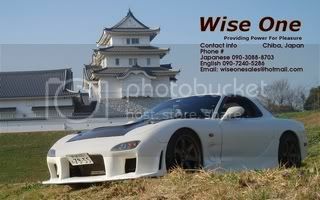 Last edited by RATED RX-7; 05-22-2008 at 09:38 PM..
Now why would you do such a thing. And why a thread like this? But the color scheme matches your avatar so well, how can you complain?